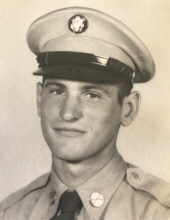 Donald Earl “Donnie” Walters, age 86, passed away peacefully following a brief illness on December 22nd 2018, at the State Veterans Home in Knoxville Tennessee. Don was born in Monroe Wisconsin on April 23, 1932, to parents Perry and Martha Walters. Don defended our country in 2 wars, The Korean and the Vietnam Wars. Don served in Korea as a Master Sergeant from 1950 to 1953. From 1954 to 1973, Don served as a Master Sergeant in the US Air Force, retiring with honors. Don was engaged as a training instructor with NATO, with his primary focus being military weapons. Don spent considerable time training crews for the NATO aircraft F104 at the Air Force Tech School at Lowry Air Force Base. Don was preceded in death by his parents Perry and Martha Walters, along with siblings Cletus, Cyril, Ralph, Basil, James, Helen, and Dorothy. He is survived by wife Diane Sue Schroeder Walters, and siblings LeRoy, Thelma, Margaret, and Mary. Also survived by children Marsha Naftzger, Michael Crump (Showni), Michele Smitherman (Marc), Monica Gibler (Dale), and Margo Gregory (Mike). Lucille Miracle, Deborah Ann Hill, Donald Earl Walters Jr., Perry L. Walters, and Terence Walters. In addition, he is survived by 8 grandchildren and 8 great- grandchildren. Plus, 2 fur babies - Gidget and Benson. Don was an avid sports fan, particularly the Cubs and Bears, a devoted husband, father, stepfather, and grandfather. He enjoyed travelling and was a competitive pinochle player. Don will be truly missed. Thank you Don Walters for your service and sacrifice on behalf of our country. A celebration of life will be held on January 3rd, 2019, from 4:00 to 7:00 PM at the Bosma-Renkes Funeral home in Morrison, Illinois. Burial, January 4th, 2019 at 2:00PM at the Rock Island National Cemetery in Moline, Illinois. In lieu of flowers, you may make donations to the St. Jude Children’s Hospital in Memphis Tennessee. To send flowers or a remembrance gift to the family of Donald Earl "Donnie" Walters, please visit our Tribute Store. "Email Address" would like to share the life celebration of Donald Earl "Donnie" Walters. Click on the "link" to go to share a favorite memory or leave a condolence message for the family.